Buying last-minute tickets (within 7 days of the event) to a game, concert, or show, often means great deals for our buyers! You’ll find that prices on the secondary market drop significantly the week of the event. Often times, ticket prices are at an all-time low. Such is the case for the below 5 events taking place tomorrow. 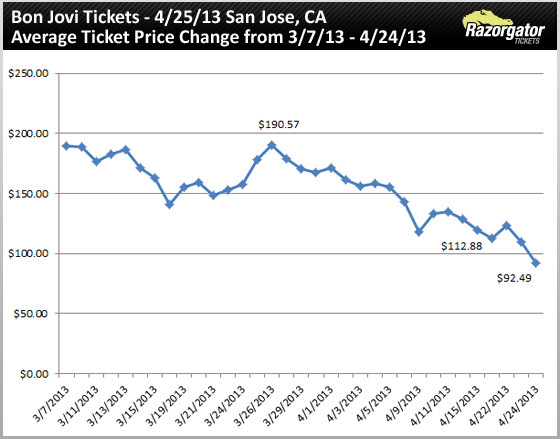 If you bought Bon Jovi tickets to tomorrow’s San Jose concert earlier this morning, you paid 51% less than a month ago on March 26 when prices peaked. The average Bon Jovi tickets are down 18% in the last 7 days and are at an all-time low the day before Bon Jovi goes on stage at HP Pavilion At San Jose Arena. Kenny Chesney Tickets prices have dropped 47% in the last 5 weeks. The average Chesney tickets for tomorrow’s Grand Rapids, MI show are down 16% in the last 7 days, a savings of about $20 per ticket. 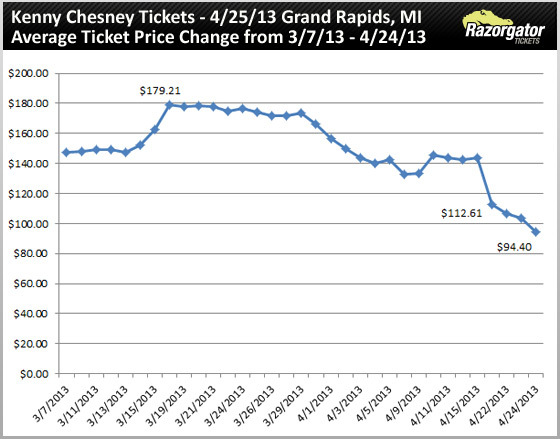 Like Bon Jovi tickets, prices today are at an all-time low one day before Kenny Chesney’s concert at Van Andel Arena. Following the trend of concert tickets, MLB tickets also fall as the game draws near. Washington Nationals tickets are down 46% since mid-March and 32% in the last week. 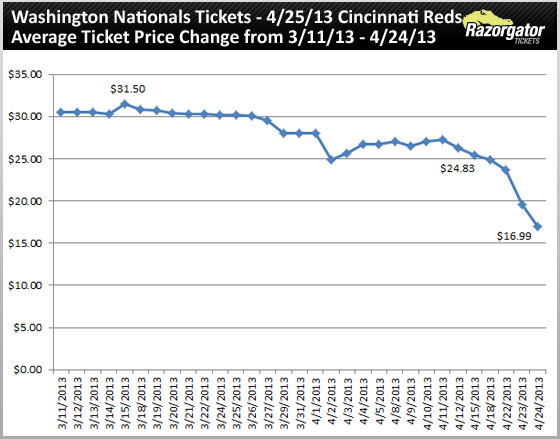 At an average price of $16.99, Nationals tickets today are the cheapest they have been since March 11. In the final home game of the regular season, the Philadelphia Flyers matchup against the New York Islanders. 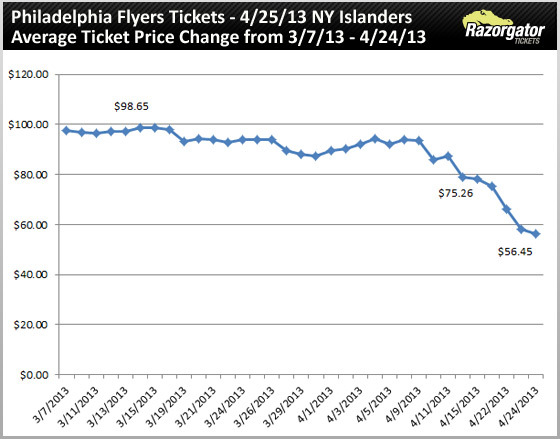 Flyers tickets peaked March 14 and have since dropped 43% on the secondary market. If you bought your tickets to the Flyers-Islanders game today (opposed to last week), you saved an average of $18 a ticket (-25%). In the third game of a three-game series, the New York Mets will host the LA Dodgers tomorrow night at Citi Field. Waiting to purchase your Mets tickets proves beneficial once again. Prices are down 24% in the last 5 weeks and have fallen even more this week. 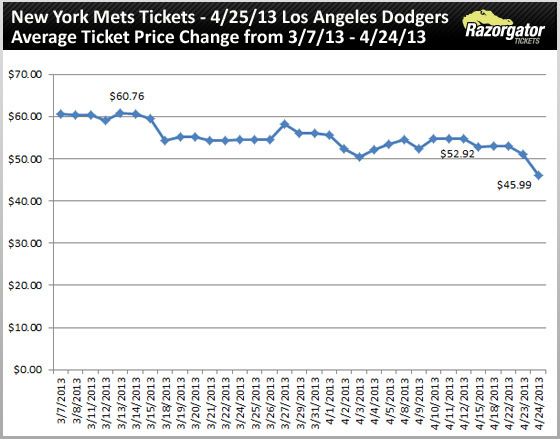 Averaging $45.99 this morning, New York Mets tickets for tomorrow’s game are the lowest we’ve seen since March 7.